How do I know if my child is ready to learn to read? Is three too young? Is six too late? I tortured myself over this with my first and have since learned ways to watch an individual child to see if they can handle learning to read. I would like to share a little trick that I came across a few years ago. It really seems to hold true, so here it is. Does your child draw people in their pictures? If they do, what do the people look like? Are they big circles with a face? Do they have arms and legs? Being able to draw a person and put the parts in the right place seems to match up with the brain’s ability to put letters together to form words. Let me show you what I mean. Notice that the people are primarily heads. The “legs and arms” are simply lines that are tacked on after, but not really in the right spot. There is also no body. This is a first stage person. Sadie drew this the other day. She is 3 and a half. I can also say that she is no where near being ready to tackle even the alphabet, let alone beginning reading lessons. I am teaching her to write her name, but she can only trace over mine at this point. I will continue to watch her pictures, and I also play copy games with her to let her try to write letters. I point out letters in books, etc. I’ll continue to watch for comprehension. This drawing has all the parts in the right place. We have a head with face and hair. The body is proportionate. The arms and legs come out at about the right place and we even see hands and fingers. No, those aren’t bunny ears, silly! This is an indian with feathers. I would call this a stage two person. Not a lot of detail yet, but everything is in the right place. This child would definitely be ready to tackle an actual reading program. This is Isaac’s drawing from the other day. He is five, and on lesson 17 in “How to teach your child to read in 100 easy lessons.” He is reading 3 and 4 letter words, and can write his name as well as copy anything I put in front of him. He also can write letters from dictation. He is probably my most advanced student for his age. This picture has no stick person elements. There is also a refreshing presence of clothing! I would call this stage three. Many grownups are too lazy to go to this effort lol! We like stick people. 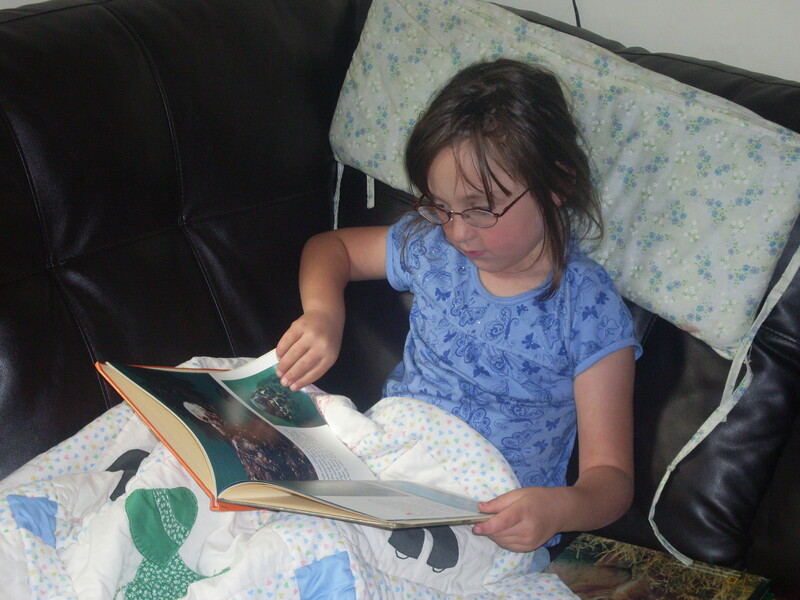 As I said before, stage two is usually a good indication of reading readiness. This stage is just a great bonus. This is Holly’s drawing. She just turned seven. She is a little bit ahead of her little brother in reading ability. Why is she not farther along? Well, I didn’t watch closely enough. I spent months trying to teach her the alphabet, and ending up boring her to death and making zero progress. I finally wised up and put her in “100 easy lessons.” They have the child reading actual words by about lesson 7 or 8. She just took off at that point because she had a reason for learning. She is now reading sentences and doing quite well. Do I think “100 easy lessons is the only acceptable reading program? Absolutely not. I started Naomi in it and took her out. She learned to read through a combination of several sources. The whole point is to watch closely. Are they ready? Are they progressing? Is the method I’m using slow enough, or, more likely, is it fast enough? Do they enjoy learning to read? I can’t stress enough that if what you’re using isn’t working, try something else. May your journey with your child down the road to reading be a happy one! And may all their drawings be fully clothed! Are you excited about teaching your children, but feel you need a bit of hand holding? I feel very confident putting you safely in the hands of the Elliotts at Homeschooling Torah. Along with their Torah based curriculum, they offer lots of support for things like teaching reading. Subscribe to our mailing list to receive post updates and great links. Very interesting. I never thought to link my child's drawing ability to reading readiness. I know my four year old does not like to write, unless she can use a dry erase marker. She colors in the lines and she knows her letter sounds. She can put together three letter cvc words, though I would not say it is a favorite activity. Her drawings are still somewhere between your person 1 and 2 descriptions. Wonder if she'll have more interest in reading/writing in the next several months as her drawing improves? Thanks for the tip! Can I link back to your blog? I had Arin draw a person and wanted to link back to this post. Thanks!